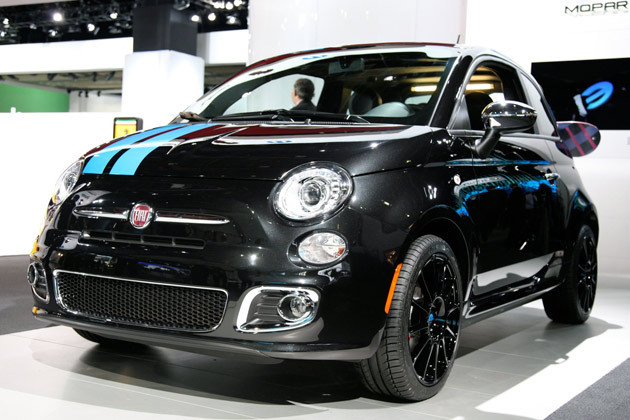 The Fiat 500 is one attractive little hatchback, but its voluptuous curves and diminutive size lend some to believe the little Italian is aimed squarely at the female demographic. We're not so inclined to agree, especially if the 500 proves to be as fun to drive as its primary competition, but a little aesthetic tuning never hurt. The experts at Mopar took a page from the Mini playbook with a slew of mods that could make it more attractive to the coveted 18-25 male demographic. The tweaks start on the outside with a bevy of chrome accents including side mirrors, a snazzy exhaust tip, chrome door handles and a very cherry 500-emblazoned fuel door. Out back you can't miss the massive snowboard carrier, and the high-gloss black wheels don't do much to avert attention either. The front end stands out with a pair of offset blue stripes that stretch all the way to the boot. Step inside and you're greeted with 500-embossed seats and door-sills guards. Check out all the mods in the gallery below. Live Photos Copyright ©2011 Chris Shunk / AOLDetroit 2011: Mopar helps the Fiat 500 man up originally appeared on Autoblog on Mon, 10 Jan 2011 18:32:00 EST. Please see our terms for use of feeds. I hate chrome, also, how are you supposed to actually see out the back window?